It's another Wolf Hall Wednesday and I've just finished reading the first two parts of Bring Up the Bodies, Hilary Mantel's follow up to Wolf Hall. And right on schedule, might I add, for the April 5th debut of the 6 part mini-series on PBS' Masterpiece Theater here in the US. 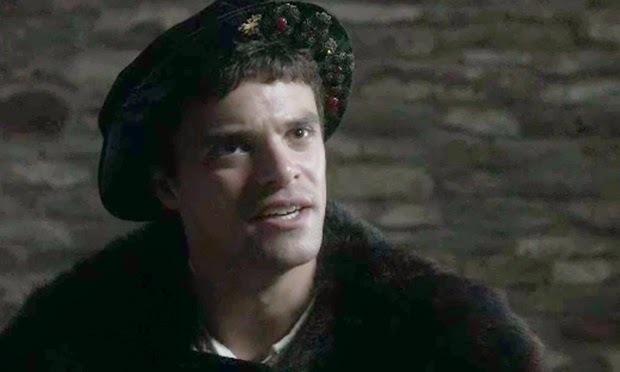 While the BBC production is called Wolf Hall, the series is based on both of Hilary Mantel's historical fiction novels about Henry VIII's disposal of the queens who fail to produce an heir to the throne. While Anne Boleyn has taken Catherine of Aragon's place, she too has so far failed to give birth to a boy. 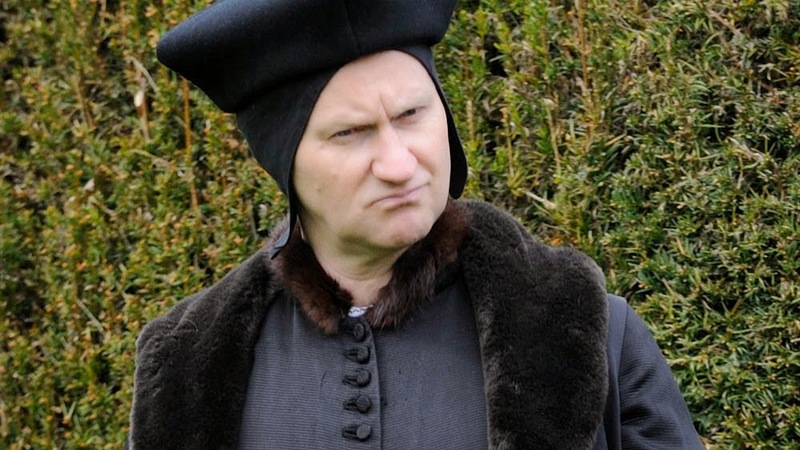 Thomas Cromwell sees the king's attention turn to the quiet Jane Seymour, in part because Henry wants to leave Anne—pregnant again— alone so as not to put their unborn baby at risk. But it's also clear that Anne's acerbic ways are grating on the king's nerves, and the plain Jane, who Anne discounts completely as a milk-sop, represents a refuge in the storm. Is it just me or, as good as Wolf Hall was, is Bring Up the Bodies so much better? Obviously it won the Booker Prize for a reason but Bring Up the Bodies immediately struck me as being clearer, more vivid and faster-paced than Wolf Hall. I'm sure part of it is that after 549 pages or so, I've finally gotten to know the cast of characters but it's more than that. While I was reading Wolf Hall I sometimes felt adrift, without a real sense of where I was, physically, wishing I could see my surroundings better. In Bring Up the Bodies, Mantel has found a way to stay with Thomas Cromwell's point of view yet clearly delineate where the reader stands and what she sees as well. Witness the entrance by Stephen Gardiner, the Bishop of Winchester and an old rival of Cromwell's from his days with Cardinal Wolsey. "Stephen Gardiner! Coming in as he's going out, striding towards the king's chamber, a folio under one arm, the other flailing the air. Gardiner, Bishop of Winchester; blowing up like a thunderstorm, when for once we have a fine day." Mantel has pumped up the volume in the way she uses language; check out her description of Anne's outfit. We don't just see it, we see it with Cromwell's barely contained distaste for the role he's been forced to play, on her behalf. "Anne was wearing, that day, rose pink and dove grey. The colors should have had a fresh maidenly charm; but all he could think of were stretched innards, umbles and tripes, grey-pink intestines looped out of a living body; he had a second batch of recalcitrant friars to be dispatched to Tyburn, to be slit up and gralloched by the hangman. They were traitors and deserved the death, but it is a death exceeding most in cruelty. The pearls around her long neck looked to him like little beads of fat, and as she argued she would reach up and tug them; he kept his eyes on her fingertips, nails flashing like tiny knives." I found myself turning the pages, wanting to read beyond the roughly hundred pages I'd scheduled for the week. 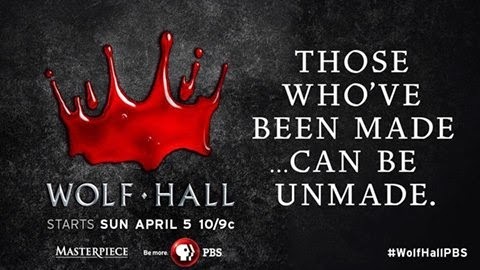 Somehow Wolf Hall had gone from challenging but fascinating to thrilling and surprising. I was having a lot more fun because the author was clearly having a lot more fun, giving her characters the most outlandish things to say. Her dialogue is as sharp and funny as those flashing nails of the queen. 'I do that anyway,' he says. 'If the conversation flags.' "
Funny, right? I'm ready for Part Two which begins with The Black Book. London: January—April 1535. The black book is a set of rules and regulations on running the court. After Cromwell is wakened when Anne Boleyn's bedchamber—accidentally?—catches fire from an unattended candle, Cromwell insists that the ladies-in-waiting be put on candle watching rotation duty. We wouldn't want anything to happen to Anne Boleyn, especially not before she can give Henry an heir.